I am thilled to be a part of the exhibit, Everybody's Ocean, at The Santa Cruz Museum of Art & History. The exhibit opens December 19th, with a celebration in the new year, January 2nd 2015. Join me! This Wednesday, June 4th for th eHeadlands Center For The Arts Benefit. I have a drawing in the auction! A limited edition Little Nemo (Another Dream) print! Available at Tantrum, 858 Cole Street, SF, Park Life, 220 Clement, SF, & The Low Tide Club, Sausalito, CA. It is printed with archival ink on museum quality paper. A review of my exhibit at Rena Bransten Gallery- A wonderful read! If you wanted to explain the Pacific Trash Vortex to a child, it would be useful to have the art of Jennie Smith close at hand. 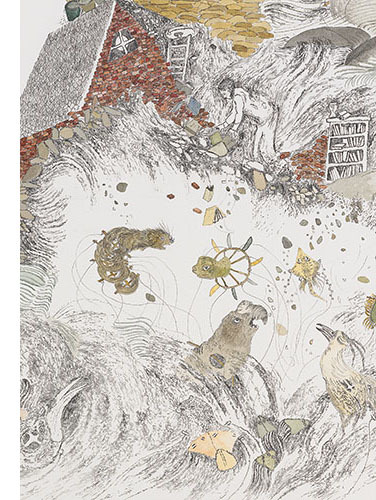 Her exquisitely detailed graphite and watercolor drawings transform a monumental environmental disaster into fairy tales whose whimsy and lyricism belie the horror of it. In fact, if you didn’t know the subject of this series you’d be challenged to venture a guess. The artist’s method – of linking thousands of small cells, crosshatched marks and gestural flurries into swirling wave forms – barely hints at the grim reality underlying the gyre of plastic trash that now drifts across the Pacific. Smith, rather than describe it in factual terms, uses her formidable drawing skills to visualize the poetry of the sea itself – in flowing wisps of flotsam and jetsam that, at a distance, resemble maps of ocean currents. Little Nemo (Another Dream), Detail, 2013, graphite, watercolor on paper 34.5 x 27"
The show’s masterwork, Untitled (1997), runs 18 feet across a wall. Looking at it, you may think of Hokusai’s famous waves. If so, it’s an understandable association. To see the bottles, six-pack rings and other bits of floating debris that the picture shows dissolving into the pelagic food chain practically requires a magnifying glass, which is why I’ve used only details to illustrate this article. That’s not a complaint — only a measure of the degree to which the artist has successfully imagined the process of plastic being biodegraded by saltwater and sunlight. Elsewhere, Smith employs narratives. Her recasting of the Little Nemo character, for example, shows a child awakening on the remains of a storm-wrecked house that is a menagerie. Similarly, in Levels, where animals and human artifacts wash out to sea; in Turtle Shell, where headless torsos drop into a void; and in Whale, where a cetacean becomes enmeshed in garbage, it’s hard not to think of another, more recent, tale of ruin and regeneration: Life of Pi. Smith may employ the illustrational style of children’s books, but it’s adults who appear to be the target of her playful, yet utterly serious admonitions. The drawings Smith created for a children’s book (The Littlest Birds Sing the Prettiest Song: Folk Music; Chronicle Books, 2012) which fill the gallery’s back room tell a different story. Made to explicate folk songs, their realism is, at times, a close to rival to taxidermy. You’ll be tempted to pet these birds to verify they’re not made of feathers. Opening is Thursday, March 21st, from 5-7. Please join me! I was asked to have a book signing at this great shop in Sausalito for my folk song book, and it would be awesome to see you there! Its Sat.Dec 8th, from 4-7. I recently made a birthday card and winter solstice card for Portland based publisher, Little Otsu.